For so many of us, High School just down right sucked. The struggles of dealing with that in awkward and developmental period between adolescence and pending adulthood can be a real painful, sometimes embarrassing, and downright horrifying time. And most of us, were given the luxury of sight when working through these disturbing times. So imagine if blindness were just a another stick in spokes of the proverbial bicycle tire that is High School life? Well, that is exactly what the beautiful souls who act as the main subjects in the soon be released documentary Do You Dream In Color? are going through, and their unique and individual experiences make for an extremely humbling experience of a film. Synopsis: Connor, Nick, Sarah and Carina are like most teenagers navigating the growing pains of high school, but unlike their peers these four teens face another challenge – they’re blind. Do You Dream in Color? is an enlightening and poignant coming of age story that captures the inspired journeys of four courageous teenagers as they strive to achieve their goals: to be a sponsored skateboarder, to travel the world, to become a rock star and to be the first family member to graduate high school. 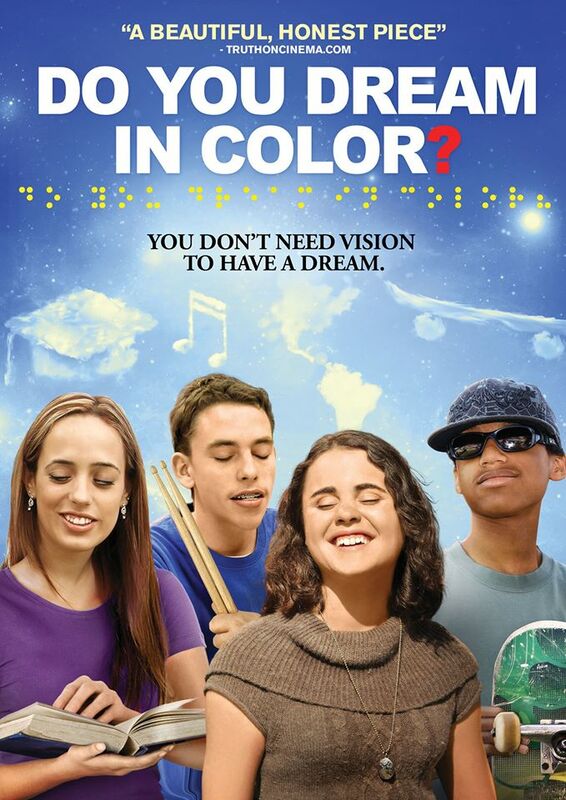 Their extraordinary stories shine a provocative light on both the social and institutional obstacles faced by people who are blind in the sighted world and what it takes to surmount these barriers. I believe it is absolutely fair and only right to admit that there is definitely going to be a large bit of bias when you go into the watching of this film. Whether the idea and subjects of the film hit home for personal reasons or not, this is obviously a film that is going to “hit you right in the feels” as the kids today would say. Any film, whether dramatic or documentary, that deals with the trials and tribulations of physical or mental impairment is destined to be given some sort of emotional leeway right off the bat. So the content was not entirely complicated to emotional convey on screen, but it became the job of the filmmakers Abigail Fuller and Sarah Ivy, to make it an exceptional rollercoaster of emotions stylized for the common viewer. And in the case of Do You Dream In Color?, I think it is only right to acknowledge that they did just that. Fuller and Ivy managed to create a film that is as captivating as it is mesmerizing, especially when you begin to understand just how little they had available in the way of resources for completing the project. Also not to mention the amount of time the two, as well as the rest of the crew, put into making this film a possibility. Between the time consuming agony of crowd funding, and the constant waiting game for distribution and festival acceptance, all of which does not even include the actual filming and editing of such a project, I sincerely believe that the end result is something completely admirable and deserves some very high praise. Now, to be perfectly clear, the film is not absolutely perfect. There are moments in watching the film when he can almost physically see the monetary restrictions that were placed on the production. Without feeling necessarily rushed, the film does feel like it has a few holes in between scenes that could have been filled with a few thousand dollars here or there, but it just wasn’t possible. But even with that being said, the quality of the film that was presented in the end really needed absolutely no improvements. It’s more of the classic complaint of “we wanted more!” type of situation. Which is actually a far more commendable aspect to the film, in my opinion. While working with so little, they managed to make something absolutely beautiful. And, again, this also wouldn’t have been possible if it weren’t for the tremendous spirit and courage of Connor, Nick, Sarah, and Corina, the film’s subjects. Seriously people, the amount of hope that this film can, and most likely will, inspire in you should be enough for you to run right to it. It is an extremely power film that can inspire generations to come. Do You Dream In Color? releases on VOD February 10th, and in select theaters soon thereafter.